Bedford Town were denied a crucial Southern League Division One Central win on Tuesday night after a stoppage time equaliser saw them held to a 1-1 draw at Fleet Town. The Eagles had looked like they were going to make further inroads on the play-off places after Lee Roache’s first half goal, only to be pegged back by Robert Carr’s late strike. Earlier, the prolific Roache hit the bar with a lovely curling effort, before he broke the deadlock on 29 minutes, bagging his 15th goal of the season, slamming home from 20 yards after a fine solo run. Home keeper Ryan Pryce then made a superb save to deny Roache a second from close range, before Carr netted late on. The result means Bedford stay seventh, five points off Marlow in fifth, having played a game more. On Saturday, Eagles had won 3-2 at Petersfield Town. The visitors were ahead on six minutes when Ben Sawyer raced through to fire beyond the home keeper. Andrew Phillips then missed a penalty, while Roache nodded home after Chris Marsh’s shot was saved, only to be flagged offside. The linesman robbed Roache of another goal soon afterwards, before Jemale McKenzie-Lowe’s double on 37 and 45 minutes made it 3-0. Ryan Woodford pulled one back from the spot on 59 minutes as did Billy Connor (88), but Eagles had done enough. 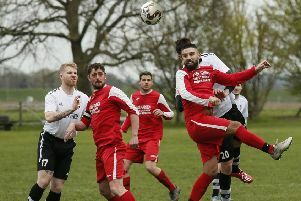 Bedford host Barton Rovers on Saturday.